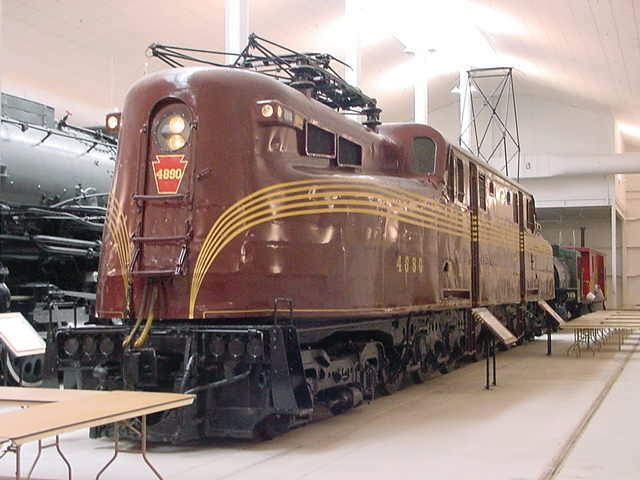 The GG1 was designed by the Pennsylvania Railroad based on the need for a locomotive that could pull more than 12 to 14 passenger cars. The railroad thought it had designed the perfect electric passenger locomotive, the P-5a, but as the P-5a locomotives arrived, it became necessary to double head them on many trains in order to protect schedules. Two other factors were involved in the development of the GG1. The chassis and wheel arrangement were a result of experiments with a leased New Haven EP3a and the streamlined body and center crew cab were an outcome of concern for crew safety. A tragic grade crossing accident in which a box cab P-5a hit a truck killing the engineer, reinforced the need for better protection for the crew. After the accident, a hold was put on further manufacture of the box cab P-5a and the locomotive was redesigned to include a center crew cab. The GG1 was given a sculptured carbody with contoured hoods that were tapered to provide visibility for the enginemen. As a result, a very aesthetically pleasing design evolved. Raymond Loewy, the renowned industrial designer, reviewed the prototype and recommended welding the shell rather than using rivets. He then suggested adding the famous pin stripes, making the design an award winner. The railroad built 139 units (#4800 through #4938) between the years 1934 and 1943. Many of them were built at the Juniata Locomotive Shop in Altoona, PA. 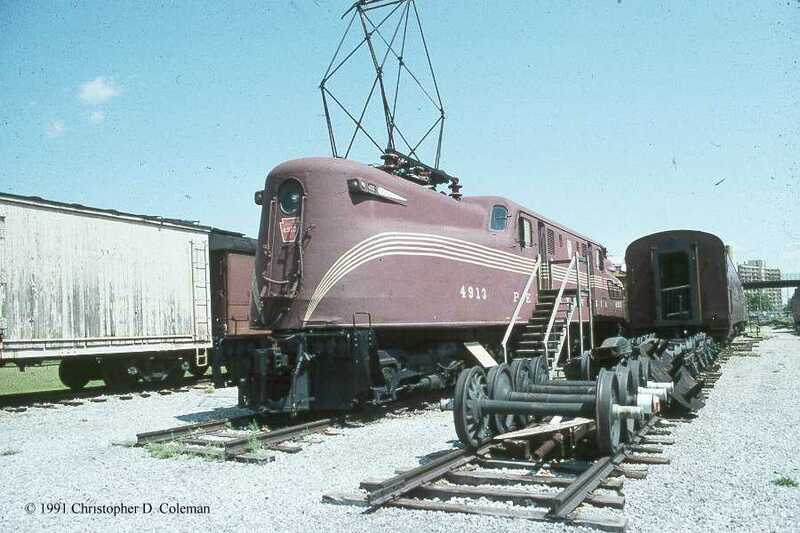 This streamlined locomotive, designed for bidirectional operation was mainly used for passenger trains, but a few were regeared for freight service. Lasting from 1934 to well into the 1980s it would be hard to find any other American locomotive design that operated for a longer period of time. The 79.5 foot long 230+ ton GG1 was built on an articulated frame which permitted its 2-C+C-2 wheel arrangement to negotiate tight curves even in congested areas. Power was picked up from an overhead 11,000 Volt AC catenary wire by a pantograph and the voltage stepped-down through an on board transformer to feed the 12 single phase 25 cycle traction motors. Each of these motors developed 385 HP giving the GG1 a total of 4620 HP in continuous operation and allowed speeds up to 100 mph. The body of the locomotive also housed large blowers for motor and transformer cooling, a steam boiler for passenger car heat, electric controllers and sanding boxes. Of the 139 units built, only 16 survive today. Some have been restored superficially and can be visited as shown below. It is not likely that any of these survivors will ever run again because of the prohibitive cost to rebuild or replace the electrical components. 4800 is the only GG1 with a riveted body. It was the prototype for the GG1. 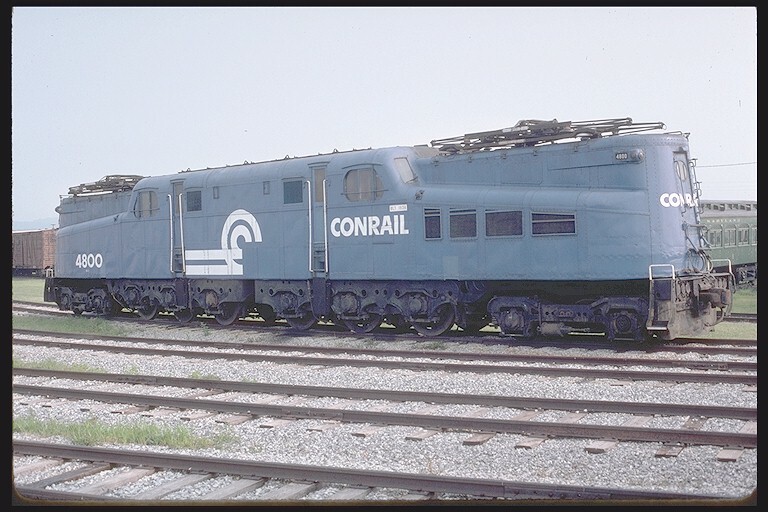 Old "Rivets" wore Conrail "dress blue" (Railroading in the North East Collection). 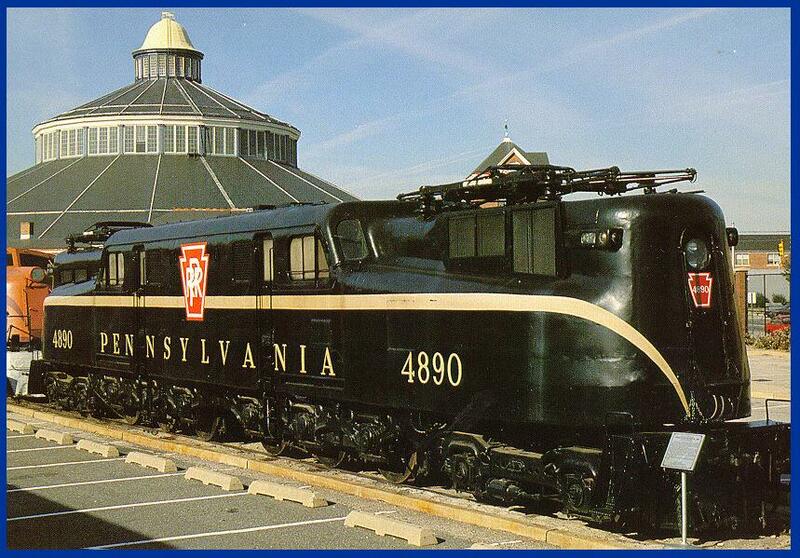 4800 was owned by the Lancaster Chapter of the NRHS and at one time was on loan to the RR Museum of PA. The chapter donated it to the RR Museum of PA in 2000. For a couple years, 4800 was out in the weather and was showing signs of deterioration. In 2002 it was moved into the expanded car barn. In 2004 it received a new paint job and underwent some cosmetic restoration. All lettering has been painted over sometime in the mid-2000's. In 2009 it was moved outside again. 4859 belongs to the RR Museum of PA and is currently under roof at the Harrisburg, PA Amtrak Station. Amtrak wants it out of their station soon. There is talk about a temporary display at Union Station in Washington, DC. One day 4859 will have to return to the museum in Strasburg, PA and when it does, there will be limited space and one of the three GG1s may have to go. Crashed in Union Station, Washington, DC in 1953. It is unfortunate that a GG1, with as much unique history as this one, was stored for so many years (1985 - 2007) in a nearby yard without protection from either vandals or the weather. In 2007 it was moved into the restoration shop compound area with some of the other large locomotives. Repainted PRR tuscan red w/pin stripes in 1981 by NJT while in service. 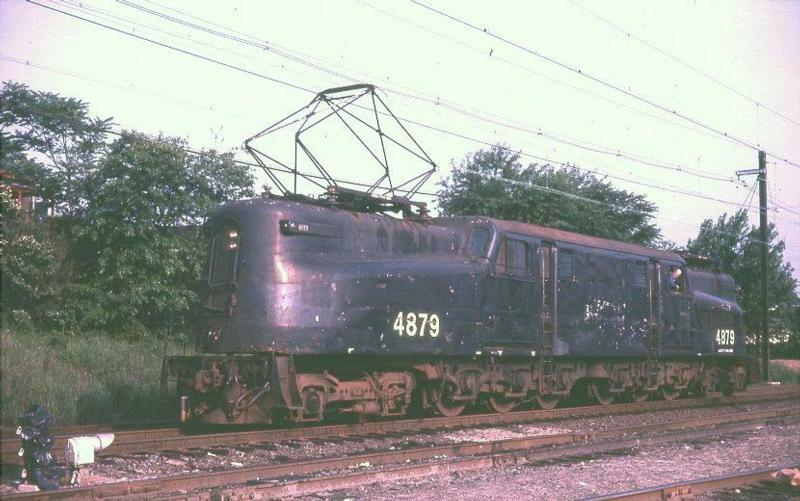 For many years this GG1 was stored in a yard near the New Jersey Transit Passenger Station/Hoboken Passenger Station in NJ unprotected from vandals or the weather. In July, 2003 4877 was moved from Hoboken to a small NJ Transit yard in the northern end of Morristown where restoration efforts could begin. There were plans to restore it to its original Brunswick Green 5 stripe and to make it possible to relocate it to various areas around the state of New Jersey for display. 4877 is now in Lebanon, NJ right of exit 20 on Route 78. There are a number of other gems there, including a 20th Century limited car in really nice shape. In 2010 4877 received some restoration work and is being repainted in its original Brunswick Green paint scheme. In 2014 it was reported that 4879 has been cosmetically restored with the Brunswick Green 5-strip scheme. Last GG1 to pull a revenue passenger train in New Jersey on 10/28/83. 4879 may have been located in Morristown around 2002. 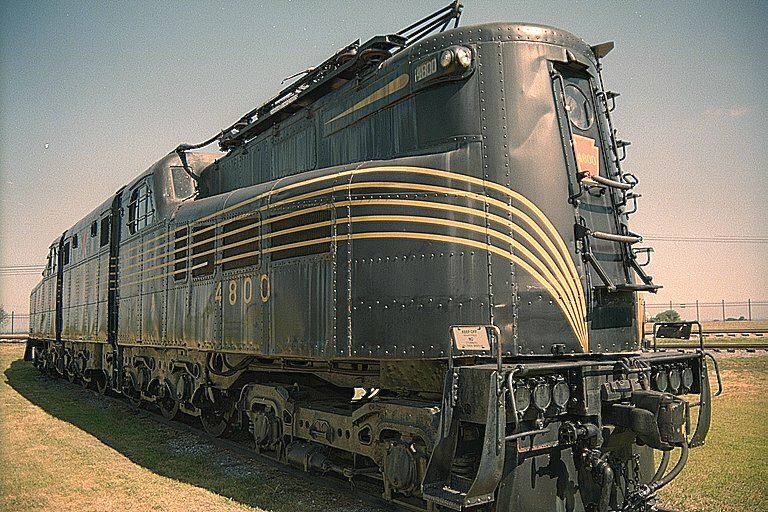 There were once plans to restore it to the Brunswick Green single stripe/large keystone scheme and display it a NJ Transportation Heritage Center in Phillipsburg, NJ. As of September 2008, 4879 was stored on a siding in Boonton, NJ with a selection of other obsolete equipment. In 2014 I heard that it was cosmetically restored to Brunswick Green with a single bold stripe. Last operating GG1. Took the last gasp in October, 1983 when it pulled two other NJT GG1s (4877 and 4879) into the yard after "Farewell to the GG1s Day" (10/29/83). In October, 1998, 4882 was painted into its PC livery. The paint job is temporary. Longer range plans are to paint it in its original PRR livery. Was displayed at B&O Museum until 1995. One of about 35 GG1s that were modified with large air intakes in the hood, which spoiled the aesthetics of this Loewy masterpiece. 4890 received a new paint job in 2000. It is scheduled to be part of the new indoor display hall: Lenfestey Center, a 26,000 square foot climate controlled facility. It will be displayed next to UP Big Boy 4017 and the General Eisenhower WWII Command Train. With PC GG1 4901, pulled the funeral train of Sen. Robert Kennedy from New York to Washington on June 8,1968. 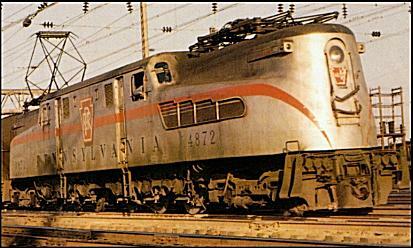 Regularly led "The Senator" and the "Congressional Limited" in its tuscan red livery. 4909 is one of the two GG1s displayed at the Leatherstocking Railway Museum. They appear to be deteriorating with each photo that is sent to me. 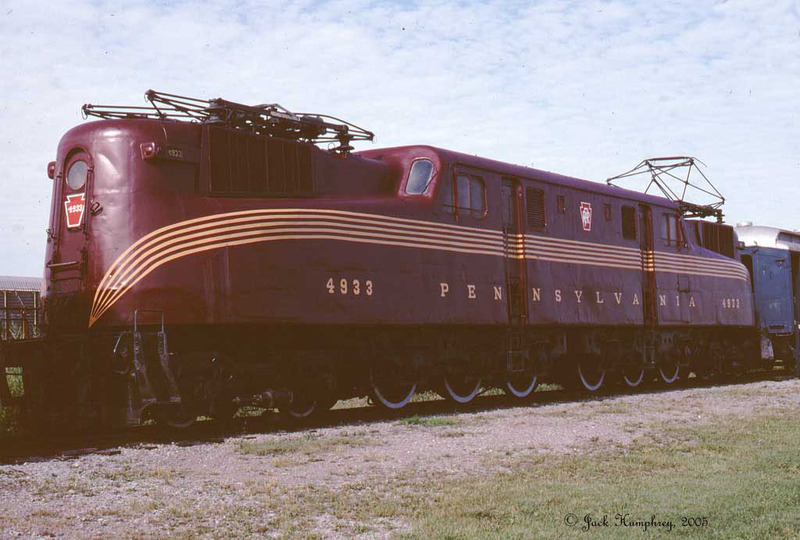 As one of the photos show, 4932 was once located at the Steamtown National Historic Site. In July, 2001, I receive email from Joe Szarmach stating that he bought 4909 and was going to cosmetically restore it. I never heard any more information about this. In July, 2003 I heard that 4909 had been acquired by the Henry Ford Museum. In August 2004, I had heard that 4909 was finally moved to the Henry Form Museum. However, I later found that it was still at Cooperstown Junction, NY. I don't know what it is about 4909 that generates so much false information. The acquisition by the Henry Ford Museum appears to be valid however. There is a news article about it here and the information has been confirmed by the museum itself. I don't know how long that article will be available. Now that the Henry ford Museum has confirmed ownership of 4909, perhaps the rumors about this locomotive will now stop. As of 2010 this GG1 is still in Cooperstown. One of six GG1s repainted tuscan red in 1952 for use with the stainless steel cars used on "The Senator" and on the "Congressional Limited". One of 75 GG1s built with Westinghouse components, the other 64 GG1s used GE devices and motors. 4917 appears to be deteriorating more with each photo that is sent to me. In October of 2007 I was informed that 4917 was being acquired by the GG1 Historic Locomotive Preservation Society of Miami, FL. In the spring of 2008 it was to be moved to its new home in Miami and begin to receive cosmetic restoration work as part of a new TV show. Contact Raymond Meyers for more details. Today, this locomotive still sits in Cooperstown. Built in July 1942 it ran almost 5,500,000 miles before it was retired 2/1/81. Became an anomaly when Amtrak numbered it 4939 in 1976. For 42 years there had not been a GG1 with a number higher than 4938. 4927 has been stored indoors (Barn No. 9) for the past 5 years. In August of 1999 it received a new Brunswick Green/5 stripe paint job. One of seven Amtrak GG1s painted platinum mist with a red hood and a blue stripe. Was the last GG1 to go to the Army-Navy game in 1975. In 2009 this locomotive was repainted into the Amtrak Platinum Mist (red, blue and silver) paint shceme. Repainted PRR Brunswick green w/ pin stripes while in service on Amtrak in 1977. The repainting of "Blackjack" was paid for by the "Friends of the GG1". Arguably the best restored and best displayed GG1. 4935 is in the best shape of all the surviving GG1s . It is indoor in a climate controlled building. In 2009 it was reported that it was in the repair shop. After experimental number 4899 became GG1 number 4800 in 1934, each successive GG1 kept its originally assigned number throughout its entire life with the exception of some of the GG1s transferred to Amtrak. 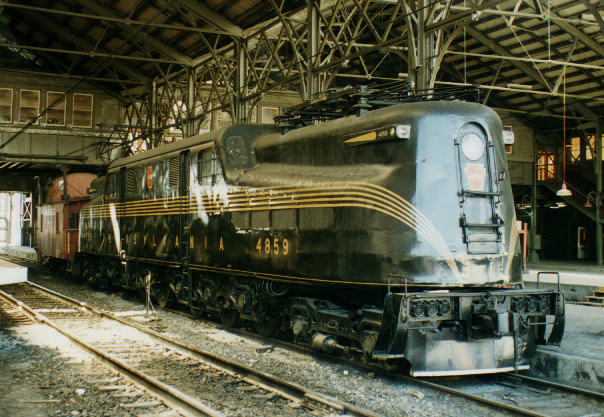 In 1971, 30 GG1s were transferred from the Penn Central to Amtrak. 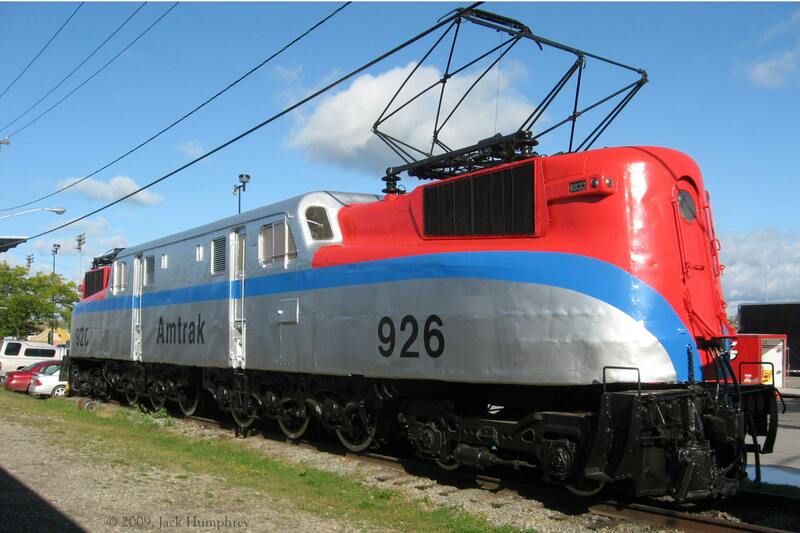 These locomotives were renumbered 4900 through 4929 and were operated by Amtrak for a while wearing the PC logo. Later, these 30 GG1s were repainted with the Helvetica style "Amtrak" and a new series of numbers: 900 through 929. In 1976 another ten GG1s came over from the Penn Central and the fleet of 40 was renumbered again. This time, numbers 4900 through 4939 were used. In the early 1980s a few GG1 were transferred to Amtrak from Conrail. They were repainted and continued to carry the same numbers that were originally assigned by the PRR. The following is a cross reference for the Amtrak 3 digit and 4 digit numbers and the original PRR number of the 40 GG1s transferred and renumbered in the 1970s. Brunswick green with 5 gold leaf pin stripes and gold leaf sans-serif Futura lettering. Small keystone on sides and noses with locomotive number. NOTE: 4800 originally had stripes that were more widely spaced than all other units, but it was later repainted in standard livery. Brunswick green with 5 gold leaf pin stripes and gold Clarendon lettering. Small keystone on sides with PRR monogram. 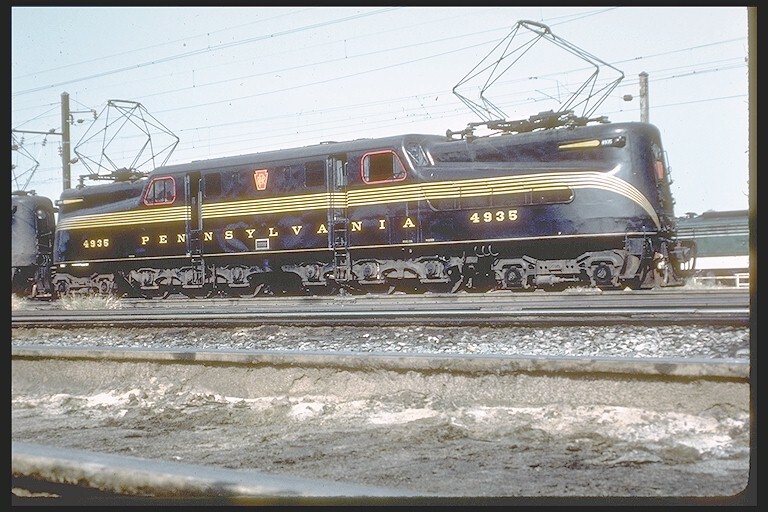 A small keystone on the noses had the PRR monogram on some units and the locomotive number on others. Tuscan red with 5 "Dulux" (a gold colored synthetic) pin stripes and "Dulux" Clarendon lettering. A small keystone on noses with the locomotive number. 4908 through 4913 painted in 1952 and 4856, 4857, 4876 & 4929 painted in 1953. Starting in 1952, as GG1s were repainted, "Dulux" was substituted for gold leaf. Silver with one 8" wide red band and 16" Roman lettering. Large keystone with white PRR monogram on sides. A small keystone on noses with locomotive number. 4866, 4872, & 4880 were later repainted Brunswick green with standard livery. 4907 and 4916 were later repainted Brunswick green with standard livery. Brunswick green with 8" wide yellow band and 16" Roman lettering. Officially listed as PRR dark green locomotive shade and is sometimes defined as 8 parts black and 1 part green. The supporting wires and structures to carry the overhead current conducting wire from which electric locomotives obtain power. On icy days or during sleet conditions both pantographs were ordered to be up. With both pantographs up the leading one would act as a scrapper to insure that the trailing one would make good contact with the overhead wire. Foundation or chassis upon which a locomotive is built. The half of the GG1 that contained the steam boiler was designated the "front" or end #1 the other half was designated end #2. Most GG1's had an "F" on the carboby to indicate the front end. Messenger Wire - The graceful shaped wire that carries the trolley wire. A descriptive term used on the PRR to mean electric locomotive. Two or more locomotives coupled together under the control of one engineer. Controls on the individual locomotives are interconnected via electric cables (MU cables) or hoses so they act in concert with the single control. Catenary and contact wire of a suspended electrical distribution system. A device mounted on the roof of an electric locomotive that is spring loaded to allow the pick-up shoe to maintain contact with the overhead trolley wire. Traction motors are mounted on a hollow tubes called a quills. The quills are concentric to the driving axles and connected to large gears which in turn are connected to the driving wheels. The gears are turned by pinions mounted on the motor shafts. The GG1 used two traction motors per axle with each motor having a shaft and pinion on each end. A receptacle on a locomotive for storing sand that is pneumatically delivered through piping to the rails directly in front of the driving wheels. The sand provides increased grip for the wheels to prevent slipping. Steam producing unit consisting of a fire box surrounded by a water space to produce steam for heating passenger cars. Red color used on PRR keystones. The electric motor geared to the axles and used to convert the transformer output to mechanical force in the form of tractive effort. The measurement of the force exerted by a locomotive at the point where the wheel tread meets the rail. The current conducting wire that the shoe on the pantagraph rubs to transmit power to the locomotive. 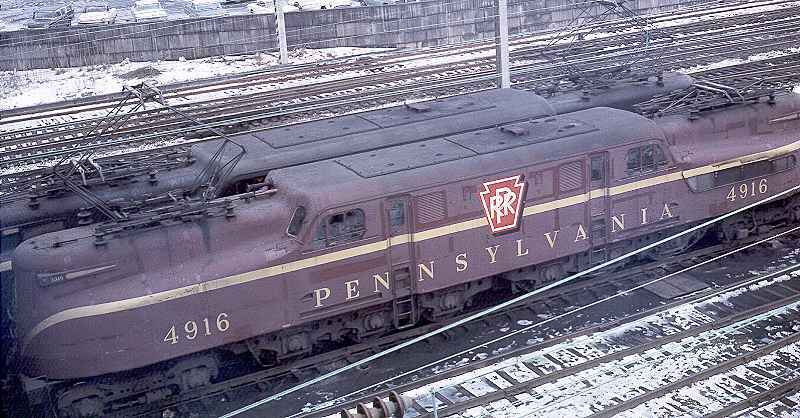 The brownish red color of many PRR freight and passenger cars. The color that 10 GG1's were painted in the early 1950's. The GG1 wheel arrangement would be indicated as 4-6-6-4 in steam locomotive terms. On the PRR, the 4-6-0 was designated as Class G. A GG1 is two 4-6-0's back-to-back, thus the "GG" and the one indicates the first design. Electric locomotives are classified by their motored and unmotored axels. The GG1 is indicated as a 2-C+C-2. The + sign indicates an articulated arrangement, the "C" means three powered axles and "2" means two unpowered axles. Will a GG1 ever run again? A GG1 will probably never run again. Steam locomotives can be restored through extraordinary efforts, if needed, to repair or remanufacture mechanical parts. Once a steam locomotive has been restored, all one needs is coal (or oil) and water, to have the ability to run if track is available. The GG1 survivors have had their transformers removed, many of the traction motors have shorted out and all of the other current carrying parts have deteriorated to the point of uselessness. The one exception may be 4935 in Strasburg, PA which may be capable of actually running if a transformer and a proper catenary were available. 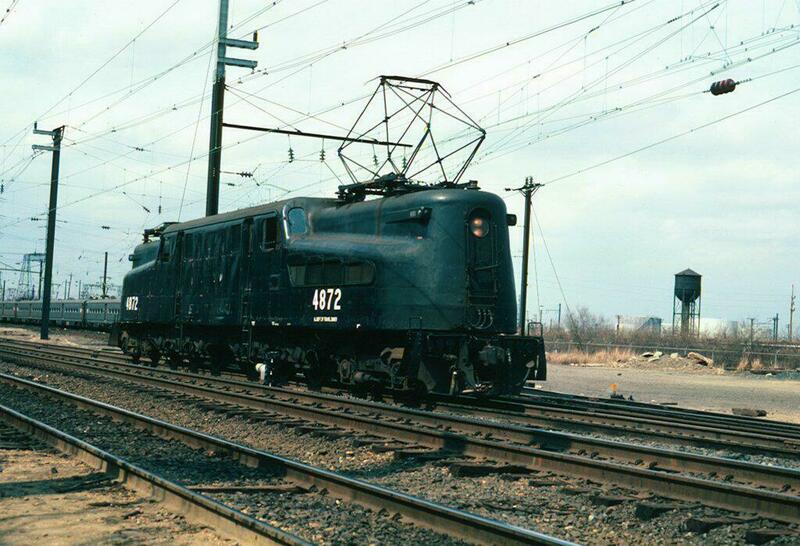 The GG1 was a 25 cycle (HZ) machine for which the PRR maintained their own substation to provide the 25 cycle current. Locomotives today are capable of operating on 25 HZ or 60 HZ and most railroads are using 60 HZ so they can buy power directly from the power companies and avoid the expense of maintaining their own substations. There is also a possible problem with contamination from PCB's, which to this point no one talks about. The GG1 transformer was cooled with a fluid known generically as Askarel (a non-flammable synthetic liquid dielectric). This liquid contains PCB's, and any evidence of PCB's would be a show stopper. Many of the GG1s had developed cracks in their frames which means major repair or replacement would be needed. In addition the drivers, the trucks, and the carbody would have to refurbished. After that, all new electrical components and controls would have to be furnished. This could possibly cost around $1.5 to $2.0 million. I seriously doubt that anyone would spend the money to get a GG1 to run. Some have spent large sums to refurbish steam locomotive but only where there has been available track to allow excursion to provide payback. With all new electrical equipment and modern controls, this new GG1 could run on the Northeast Corridor or any other electrified railroad but, it would not be an authentic GG1, it would simply be a modern electric locomotive with the carbody of a GG1. Unfortunately changes in technology have finally, after 60 years, forced the retirement of the most durable locomotive of all time.